If you are new to Big Dog Mom, then you might not know this. I am not a certified dog trainer. I am a dog trainer. And, believe it or not, if you own a dog, you are a dog trainer too. Or at least you should be. Here is the distinction in very simple terms. 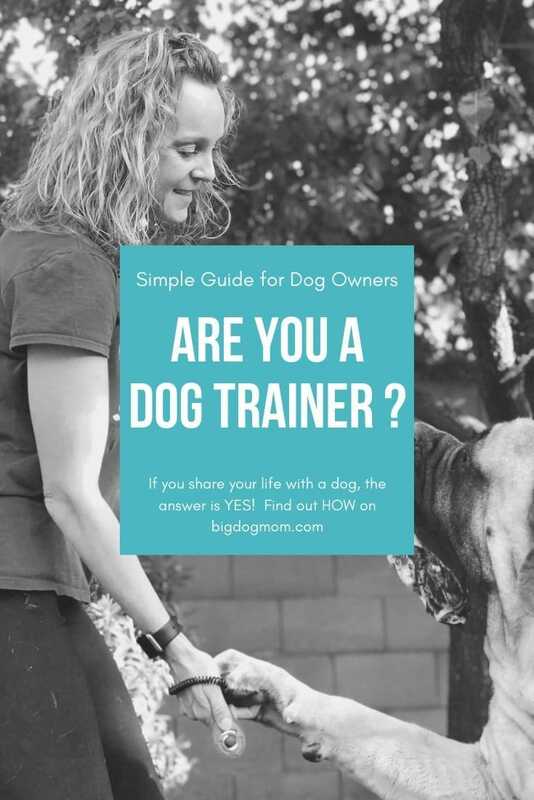 A certified dog trainer is someone who trains dogs for a living. These folks, when trained in positive training methods and canine behavior, can be an enormous asset to all dog owners. Not only in the services they offer, but the tremendous knowledge, experience and information they provide. A dog trainer is an empowered dog owner who takes the responsibility of training their dog seriously. This is a dog owner who desires a better partnership and relationship with their dog and understands that a better relationship with their pet starts with better communication. 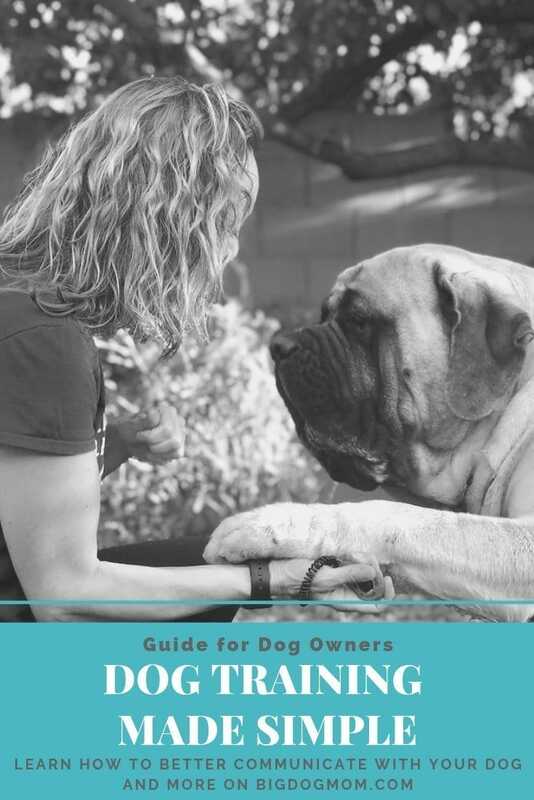 While the combination of both types of dog trainers is where the magic really happens, dog owners can do so much more in the comfort of their home to build the foundation of better communication with their dog. Better communication starts with a basic knowledge of how dogs learn. Classical conditioning is also called Associative Learning, Pavlovian Conditioning, and Respondent Conditioning. All of these names have one thing in common – that this type of conditioning is based on a response, not a behavior. Classical conditioning, as I mentioned in How to Teach a Dog to Come: Train a Dog Recall that Works Every Time, has nothing to do with the behavior of your dog, it has everything to do with the feeling he or she has to some stimulus. In classical conditioning, you become the conditioned reinforcer. In other words, you become the thing in the middle helping your dog pair something that has no meaning with something that does in order to give that former meaningless thing some meaning. Sound confusing? Stick with me and I promise it will make sense. Let’s start with a few definitions so you understand the moving parts in classical conditioning. I am going to use the freezer drawer as my example (read How to Teach a Dog to Come for the full story). Unconditioned Stimulus: Ice (usually some type of treat). Unconditioned Response: The reaction to the ice (or treat). This is not trained, it is automatic. My dogs naturally drool when they see or smell ice or treats. Conditioned Stimulus: The sound of the freezer drawer. This is usually a sound or an object that formerly had no meaning to the dog. It is often called a neutral stimulus because the dog is indifferent to it. Conditioned Response: When the freezer drawer is paired with receiving ice (or an object is paired with treats, or the door is paired with a friendly guest), the dog will drool at the sound of the drawer opening in anticipation of the ice. Put simply, classical conditioning is not about learning. It is about responding, reacting, and feeling. Russian physiologist, Ivan Pavlov is the man who is credited with much of what we know and understand about classical conditioning today. His classical conditioning experiments with dogs illustrated just how powerful this type of dog training can be. Here are 5 classical conditioning examples in everyday life that have been used either directly or inadvertently to pair two stimuli together to give meaning to the meaningless. The sound of the freezer drawer opening means one and/or two things to Junior and Sulley – ice and going bye-bye. Since the ice maker on our refrigerator doesn’t work (thank you Electrolux), we fill two ice trays manually and every morning I have to dump new cubes into a plastic freezer bag for the day. From the dog’s perspective, every time the freezer drawer opens, there is a high likelihood the person is getting ice and if they come running, they will get a cube. And if that drawer opens in the morning, they come grab their cube of ice and run to the door. Why? Because the last step before I take the kids to school (“go bye-bye”), is filling the water bottles. For the record, not once did I ask the dogs to come, drool, or go bye-bye. They automatically paired the sound of the freezer drawer and gave it meaning based on what followed the sound. Unless the plastic bag sound is preceded by the sound of the drawer where I keep our Ziploc bags, the dogs will come running when they hear it. Why? Treats of course. 3. Garage door opening, a knock on the door, the doorbell ringing …. All of these sounds trigger an immediate and enthusiastic reaction in my dogs that occurs every single time. Before you can use a clicker in any type of dog training, you first have to give the clicker meaning. You do this by pairing the clicker with a treat. It looks like this: Click-treat, click-treat, click-treat. After the click is heard 30 or more times and followed by a treat each time, the dog begins to pair the sound of the click with a reward. The clicker serves as a conditioned reinforcer (a bridge or a reward marker). EXCLUSIVE: Dog Training eBook, an informative pdf sent via email with every order. A brand new happy communication mode with the pet. Great for training puppies and young adult dogs! Fits nicely in your hand, it has elastic wrist strap so you don't drop it. Button presses easily and comes right back up without getting stuck, good sound, not to loud or soft. The Clicker can not only train the dog but also the cat, bird, chicken, sheep and even mouse. 100% MONEY BACK GUARANTEE & LIFETIME WARRANTY. Don't miss! Not all of classical conditioning is ice cubes and treats. For example, pairing the word “NO” with some behavior. Now when your dog hears the word NO, he anticipates the punishment (a jerk on the leash, for example). Or an even better example is one of phobias that can form through classical conditioning. This occurs when a single pairing of a neutral conditioned stimulus (something with no meaning to your dog initially, like the vacuum cleaner) and a frightening experience (the scary, loud sound of the vacuum cleaner) can lead to a lasting phobia (being afraid of the vacuum cleaner). To expand on the concept of phobias, I thought I would briefly touch on the topic of counter conditioning. Counter conditioning is when you pair something the dog doesn’t like (fear of loud noises, phobia) with something he does like (as long as the value of the reward is high enough) in order to change his response to the previous scary thing. There are numerous ways to go about counter conditioning including habituation (repeated exposures to lesson the response), systematic desensitization (working from least problematic to most problematic), and flooding (not recommended). If you want more great information about canine behavior and counter conditioning, I would recommend Dogwise orAmazon. Operant conditioning is also called Instrumental Learning or Instrumental Conditioning. Through operant conditioning, your dog makes an association between a particular behavior and a consequence (reward or punishment). In contrast to classical conditioning, this type of training is entirely about the dog’s behavior. B.F. Skinner is referred to as the father of operant conditioning, and his work is frequently cited in connection with this topic. His 1938 book The Behavior of Organisms: An Experimental Analysis, initiated his lifelong study of operant conditioning and its application to human and animal behavior. In a nutshell, Skinner showed through his work using the Skinner Box, that consequences (reward or punishment) lead to changes in voluntary behavior. Punishment (less likely to occur again). Negative – the removal of a stimulus (not necessarily bad). Positive Reinforcement: For example, giving a treat to make a behavior more likely to occur again. Positive Punishment: For example, giving a correction to make a behavior less likely to occur again. Negative Reinforcement: For example, a dog turning off a behavior which stops the negative thing from happening. Like when you pull up on his collar to get him into a sit – sitting turns off the correction. Negative Punishment: For example, withholding a reward. Taking the treat away makes the behavior less likely to occur again. With a little math (addition and subtraction) coupled with rewards and punishments, dogs start to make associations about their behavior and the consequences from the world around them. 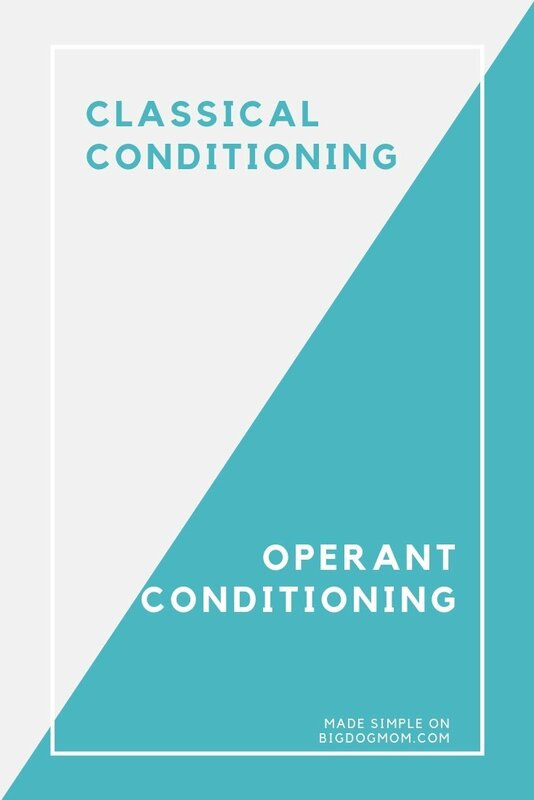 Here are 4 operant conditioning examples in everyday life to help illustrate how this can be applied in the big dog world. Many smart dog owners have taught their dog to do this very handy trick. Basically, the dog learns that if he rings the bell, he will get let out. If he doesn’t ring the bell, he doesn’t get to go outside. This is a multi-step behavior that would generally be taught using treats and positive reinforcement for ringing the bell. This is one of the most simple behaviors to teach and it generally only requires a few treats as a positive reinforcement. No, I am NOT suggesting you do this. I am simply illustrating how this applies to operant conditioning. The prong collar in this case would be used as both a positive punishment (prongs pinch to make pulling on leash less likely) as well as a negative reinforcement (prongs stop pinching when dog walking by your side). Beyond the scope of this post is to explain the myriad of reasons the prong collar is not an effective tool for teaching loose leash manners or why it is counter-productive in enhancing your relationship with your dog. For now, I just want you to see how each of these quadrants are applied in our daily life with our dogs. Saving the best for last. My favorite topic – dog nails! Positive reinforcement: You give your dog a treat while cutting to encourage your dog to stay. Positive punishment: You use force to make your dog’s pulling or running away less likely. Negative reinforcement: You use a collar, sling, or physical force that loosens when your dog is still and compliant. Negative punishment: You withhold treats to make your dog’s running away or pulling his paws away less likely. Do any of these sound familiar? Let me know in the comments below. Like so many things in life, there is not a one size fits all dog training technique that is going to work in all situations, for all dogs, all of the time. Classical conditioning has its place as does operant conditioning. And both are terrific and necessary in their own way. That said, there are some key factors you need to understand BEFORE you get started with training your dog, particularly as it relates to using an operant conditioning method. If the reinforcer (treat) is not what the receiver (dog) wants, this type of training will not work. The treats you use will need to be of sufficient value to your dog for this method to work. Additionally, the value of the treat often has to be progressively increased in order for operant conditioning to continue to work. To illustrate, let me ask you a question. How effectively could you train your dog to ring a bell to go outside using a piece of dry kibble? How would your dog’s motivation change if you were using a piece of steak? The value of the treat makes a huge difference with operant conditioning. If you are asking for complex behaviors you will want to make sure you are using treats with a value commensurate with the difficulty of the behavior. In addition, you may need to reinforce more simple behaviors with increasingly valuable treats in order to maintain the likelihood of those behaviors occurring. Let’s first define intrinsic and extrinsic so this is clear. Put simply, intrinsic is something derived from within. Extrinsic means that something is derived from an external source. In the world of dog training, an intrinsic reinforcement is something from within that makes a particular behavior stronger. So for a dog, things that might be intrinsically reinforcing might be sniffing, chewing, fetching, barking, digging, etc. On the other hand, an extrinsic reinforcement is produced indirectly by the behavior itself and therefore comes from an external source. For example, when you ask your dog to sit. The act of sitting is not intrinsically reinforcing to your dog unless he is very tired and wants to rest. But you can increase the likelihood of him sitting by reinforcing the behavior with an external reinforcer (treat). So, what does all this have to do with operant conditioning, you ask? The issue with respect to extrinsic (operant) reinforcement lies in the fact that you have to physically be there handing out the reward (treat) each time. Constantly dispensing reinforcements in order to get the desired behavior. So, with operant conditioning, not only are you having to increase the value of your rewards over time, but you are also forced to consistently dole those rewards out to get the behavior you want. Once a dog fails to see the value in the reward, or the reward isn’t there, the behavior is less likely to occur. And lastly, any presence of aversive stimuli will cause avoidance. With a child this might look like punishing or taking away a privilege. What child behavior experts have found is that it is better to reward behavior (catch them doing something good) than to punish bad behavior after the fact. In addition, punishment or withholding reward doesn’t solve the root of why the behavior occurred in the first place. Our canine children are not much different. Think of the last time you tried to potty train a puppy. The best way to accomplish a pee-free home is through prevention and reward BEFORE the puppy pees in the house. When you punish a puppy for peeing in the house, the only connection he makes is the one between you and the punishment. Or what about my favorite subject, cutting dog nails? For many dogs, the mere presence of the nail clipper or Dremel is viewed as an aversive stimuli. The resulting avoidance can seemingly require either force, restraint or coercion in order to accomplish the simple task of clipping nails. There are better ways, I can promise you that! “Education in the most powerful weapon which you can use to change the world” ~ Nelson Mandela. I can almost hear the critics now. Here’s why. Because I am not asking you to pay me for training my dog. There is no expectation except the one between me and my handsome big dogs. The expectation that they deserve a human that not only understands them, but is willing to step into a world she is not certified in to give them a better life. I am the dog trainer of my dogs. And you can be too. Consider the next time your dog comes running without a recall his way of telling you. Imploring you. Consider that come his silent invocation for you to take action. Can you think of any classical conditioning examples from your everyday life? Have you ever used operant conditioning to train your dog? Type yes or no in the comments below and tell me about your dog training experience. And in case you are interested, here are a few more posts on the topic of dog training that I dared to write. Trimming Dog Nails Like a Pro: Dog Nail Clipper or Dremel for Dog Nails?